Hi, my name is Jake and I’m 13 years old. This is my first contest with Podium and my first time using it, so I’ve been using the trial version. I’m hoping to be able to buy Podium and the Podium Browser because someday I want to have a job in design. 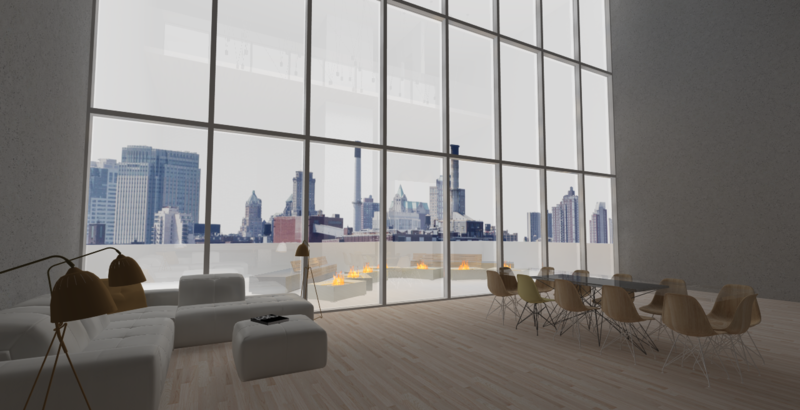 I designed this to be a penthouse in NY, and I wanted to go for VERY tall ceilings. So the first floor ceilings are 20’, and the second floor ceiling is 10’. On the first floor, there is a living/dining room, a bathroom, a kitchen, and a small gaming loft. On the second floor, there is the bedroom and a medium sized gym. In my second render, I decided to change the brownish colors to a 50’s blue (I think…), and put in some lighting. In my third render, I wanted to take a picture from the patio. For the buildings around this shot, I used a 20% reflective material, but I later turned the reflectiveness to 0% since it made the renders take a lot longer to process (x2-3). My fourth render is of the living room (I created the emoji art in Affinity Photo). In the fifth render, I started working on the lights, bump mapping, and the exposure scale a bit more. Next, I worked on the bedroom. I got the idea for the lighting on the edges from a Chipotle bathroom I was in once. In the next render, I worked on the lighting in the bathroom, and I used a grainy look with it (I used PIE for these). Next, I finished the kitchen (I also used PIE in this). And last, I worked out in (oops, I meant worked on the gym. Thanks for reading this, and thank you for your consideration.